Abstract: Baillon et al’s Cochrane review included 430 participants with agitation in dementia from five randomised controlled trials. Overall, the reviewers found that valproate was no better than placebo for the treatment of agitation in people with dementia; however, the quality of the studies included was very variable. Adverse effects and events were higher in the treatment group compared with the controls, although these finding were largely based on low-quality data with incomplete reporting; thus, valproate's safety profile is of concern. This review demonstrates that there is insufficient evidence to change current treatment guidelines.DECLARATION OF INTERESTNone. •Implement approaches to treat cognitive impairment in bipolar disorder.DECLARATION OF INTERESTB.J.S. consults for Cambridge Cognition, PEAK (www.peak.net) and Mundipharma. •Understand the role of psychiatrists in the MAPPA processDECLARATION OF INTERESTR.T. is a member of the London Strategic Management Board for MAPPA. •understand the relevance of the internet, social media and technology-based apps to human relationships, including the use of technology in sexual offendingDECLARATION OF INTERESTNone. •recognise evidence-based treatment options for patients at clinical high risk for psychosis.DECLARATION OF INTERESTC.A. has received non-financial support from Sunovion and Lundbeck in the past 36 months. Abstract: Obsessive–compulsive disorder (OCD) is a common psychiatric condition and many patients have childcare responsibilities. A small proportion have aggressive and sexual thoughts about their children. There is little risk that they will act on these thoughts, but primary healthcare and social care professionals are often unaware of this and instigate unnecessary and potentially harmful child safeguarding processes. 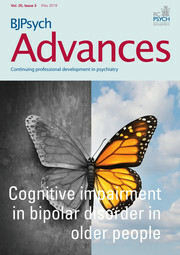 Psychiatrists have an essential role in educating and liaising with other professionals to prevent these inappropriate interventions.DECLARATION OF INTERESTNone. •Be aware of the ethical aspects of elective surgical amputation as a treatment for the disorderDECLARATION OF INTERESTNone. •broadly understand the evidence for psychological and pharmacological therapy for treating PTSD, sleep disturbance and pain in refugees.DECLARATION OF INTERESTNone.